The below article comes from the Alzheimer's Association and was written in 2013. However, it is a wonderful article that still needs shared. There are a few links to other articles that may be benefial as well. During February, Black History Month, the Alzheimer's Association sat down for a one-on-one talk with Dr. Goldie Byrd, an African-American scientist who has spent more than a decade researching the genetics of Alzheimer's disease. 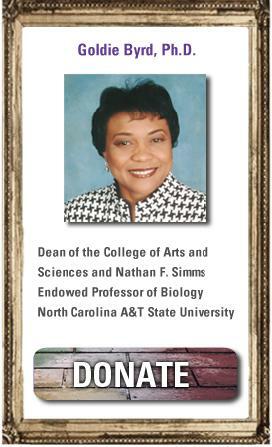 Early in her career, Dr. Byrd recognized the impact of studying the nature of Alzheimer’s disease on a genomic level. Here are some of her thoughts on her observations and her motivations for continuing her research. "I decided to focus my research on Alzheimer's because it's a disease of disparity, affecting some populations far more than others; its genetics aren't well understood; and it had an impact on my family. There's a tremendous stigma about Alzheimer's. People perceive it as affecting their social standing, their professional opportunities ... they don't want be associated with that kind of stigma, especially coming from a community that's had an historical struggle to integrate. I remember when people wouldn't talk about cancer — it was taboo. Now people are proud to say they're survivors. I want to create a buzz about Alzheimer's so that people feel free to talk about it. I want more information out there and more literacy about the disease. We need to do a better job educating people about how to care for those with Alzheimer's — that will help with the embarrassment. And we need to provide resources to help caregivers who have an extraordinary challenge. This disease can strip a family of so many things, including their finances. People also need to understand that the healthier we are, the healthier the brain will be. We need to increase physical activity, reduce stress, control high blood pressure and cholesterol, reduce obesity and eat a healthy diet. Often, these things are related to socioeconomics. But where we can make changes, we should. Education really is key." Dr. Byrd and her team were recently recognized with a $1 million grant for outreach activities. It will be used in part to support "Keeping Memories Alive" a project to bring better understanding about Alzheimer's to all those with the disease, caregivers and policy makers. Thank you, Dr. Byrd, for continuing to make an impact on all those affected by this devastating disease, and especially on the African-American community. Visit alz.org for more information on the specific risks to the African American community.